OREM, Utah – June 18, 2015 – Gold Tip and Bee Stinger pro shooter Levi Morgan added another championship to his 2015 accolades this weekend when he won the second leg of the IBO Triple Crown in Erie, Pennsylvania. After taking home the title from the first leg last month, he is now the hands-down favorite for the final event in Marengo, Ohio in July. 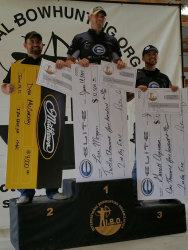 Morgan won using Gold Tip Ultralight Pro Series 22 shafts, while Garret Ayersman took the third spot shooting the Gold Tip Ultralight Pro X-cutters. All of the top three Men’s Pro shooters were shooting Bee Stinger Premier Plus stabilizer systems. The IBO National Triple Crown events are held in May, June, and July with the IBO World Championships in August. These tournaments are the proving grounds for the world’s best archery equipment and are where manufactures receive feedback from some of the best shooters in the world. Gold Tip and Bee Stinger shooters have had unrivaled success in this world of 3-D archery, proving that the products coming out of the Gold Tip and Bee Stinger facility in Orem, Utah are some of the finest in the archery industry. Gold Tip and Bee Stinger are two of the most recognizable and trusted archery brands on the tournament trail and in the hunting woods. They are brands of Vista Outdoor Inc., an outdoor sports and recreation company. For more information go to www.GoldTip.com and www.Beestinger.com.